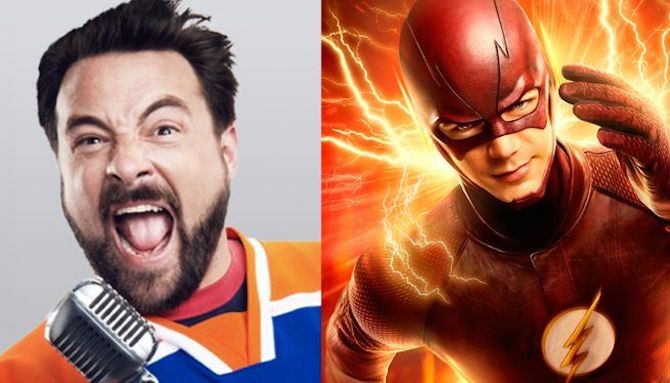 Early Sunday, the CW Network confirmed that Kevin Smith would have a go at The Flash. Best known for his over-the-top comedies, Smith has been branching out and creating a variety of different projects in the past years. Not to mention Smith wrote the script to the long lost Superman movie, Superman Lives, and has written a number of comic series, one of his most notable being Batman: The Widening Gyre. However, Smith has never written anything for The Flash. Although the CW Network only announced that he’d be directing an episode, it’s safe to assume he might have some creative say on the writing of it as well. Obviously nothing that would change the arc of the season, but some additional humor and a few twists might come into play. The announcement took place at the Television Critics Association meetup on Sunday, but no details of which episode, either date or episode number, were announced. The most information we got around that was to expect his episode to air in May, shortly before the season finale. Surprisingly there has been no comment from Smith himself on the matter, but with how active he is on his podcast network and social media I’m sure details from him will start to surface very soon. What’s your take on Kevin Smith directing an episode of The Flash? Let us know in the comments below.